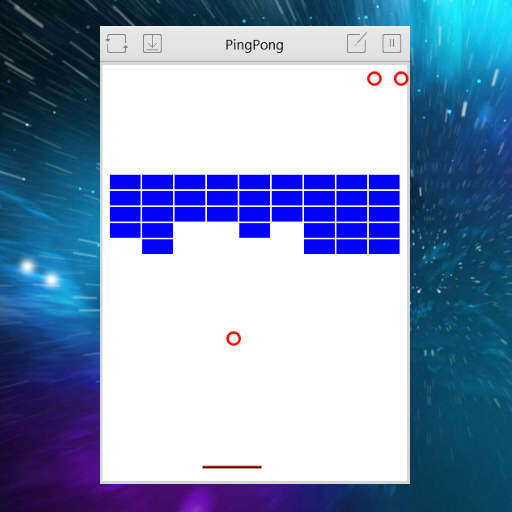 One of the demos in the Box2d for Delphi Firemonkey project is a demo called PingPong which implements a game similar to Arkanoid or Breakout. Arkanoid and Breakout are classic arcade games originating in the 1980s. The demo project is for Delphi XE5 and Delphi XE6 but should also work in AppMethod. The idea behind these kind of games is that you have a block of bricks near the top of the screen and a paddle at the bottom of the screen. You bounce a ball with the paddle against the bricks at the top to break them. There is a version of the project for desktops like Windows and OSX. And there is a mobile version of the project for Android and IOS. A couple additional features that the game has is the ability to create new levels which are different configurations of the bricks using a map editor. The bricks that you can add using the map editor are “Unbreakable”, “Hit Once”, “Hit Twice”, and finally “Hit Thrice”. They are pretty self explanatory but they provide and extra layer if gameplay when building levels. The objects in the game are drawn using the draw methods so if you want to use images in place of the existing drawn objects you will have to implement that yourself. In one test I did I was easily able to attach a TCircle to the ball and update it’s position in the Paint event. Full source code for the physics engine which is Box2d is provided in the download. Download the demo source code for a version of Arkanoid / Breakout for Delphi XE6 Firemonkey.